Islands is by no means a new name in the indie music ground, (duh, some of you might say), but if it wasn’t for this song, ‘Dnttakemy Wingzz Away’, I wouldn’t have been alerted on the band’s existence, let alone their brilliance in the form of music-making. This pop tune isn’t so far removed from how the band’s name, Islands, would appeal to listeners; so whatever you’re envisaging right now, you’re probably, already on the right track. ‘Dnttakemy Wingzz Away’ starts subtle then turns melodramatic with its swaying melodies, escorted by despondent strums of the chords and fidgeting violins. This track is made available in the limited edition of the Alphabet Series 7’’ that’s obtainable on Tomlab. Islands are also slated to be releasing a new record due this 20th of May, entitled Arms Way. 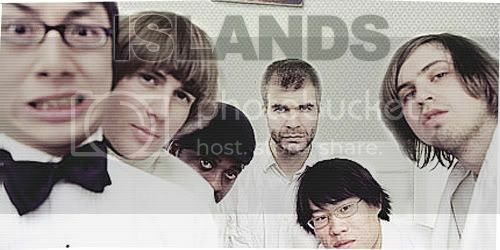 While anticipating for that though, one could always catch up with previous Islands’ assortment, particularly their 2006 debut, Return to the Sea; that’s said to be filled with a batch of quirky, striking, and refreshing songs.